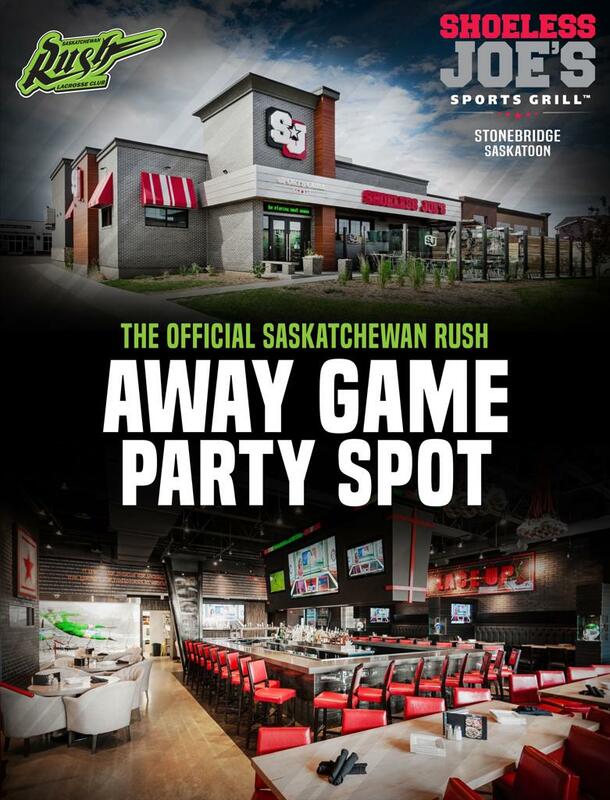 Shoeless Joes Saskatoon is giving Rush fans across Saskatchewan a place to call their own this year! Join #RushNation at Shoeless Joes for the Ultimate Rush Fan experience with members of the Original 16 Electric Crew. Provide your game day ticket pre & post game at Shoeless Joe's and receive a special drink offer! Enjoy a pre-game meal at Shoeless Joes and jump on the fan bus, departing Shoeless Joe's for SaskTel Centre at 6PM nightly. It will depart SaskTel Centre Post-game, taking fans back to Shoeless Joe's to celebrate the Rush win! *Please note, due to limited space, only fans who receive a wristband will be able to take advantage of the park and ride program. Join members of the Original 16 Electric Crew for the Official Post-game Party after every Rush home game and enter to win cool prizes courtesy the Saskatchewan Rush! Fans can also enjoy featured hand-crafted burgers and signature caesars post game! Watch every Saskatchewan Rush Away Game in the 2018 Season at Shoeless Joes surrounded by fellow fans of #RushNation and members of the Original 16 Electric Crew for your chance to win cool prizes all season long!